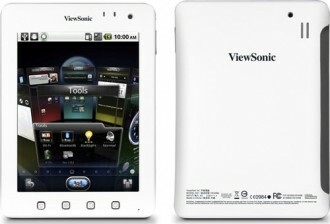 ViewSonic has announced that they will be releasing their ViewPad 7e tablet in North America by the end of October and Latin America in November. The 7-inch portable will ship with an estimated suggested price of just $199.99, the same as Amazon’s Kindle Fire. Specifications on the 7e include a screen resolution of 800 x 600 pixels, a 1GHz single core processor, 512MB of RAM, 4GB of internal storage (an additional 32GB can be added via microSD card), a micro HDMI port and a 3MP rear camera as well as a 0.3MP front-facing cam, all running on Android 2.3 Gingerbread. There is also support for Wi-Fi 802.11 b/g/n and Bluetooth 2.1 +EDR, although there’s no word yet if a 3G version will be offered. Batterly life is listed at only five hours on a full charge. On the software side, ViewSonic is quick to point out a few key features and applications that come pre-loaded on the tablet. Amazon Services and Amazon Kindle for Android are both pre-installed, as are Twitter, TuneIn Radio and WildTangent games. ViewSonic has also spruced up the default Gingerbread interface with their ViewScene 3D UI which is said to bring “holographic visual effects” to the home screen. RiteTouch technology allows you to write directly on the tablet, select and highlight as well as zoom in and out of content using either a finger or a stylus (no word if the latter is included). A Swype keyboard comes standard which should let you compose messages faster than a standard tablet keyboard. Amazon’s Kindle Fire, on the other hand, still seems like a slightly better product, at least on paper. The Fire features a dual-core processor, a 1024 x 600 resolution IPS display and 8GB of internal storage. More importantly, the Fire will have access to Amazon’s vast array of services. Amazon’s tablet will begin shipping on November 15.